How perfect can one album possibly be? That's the question I find myself having to ask when considering my adoration for The Vamps' debut album, Meet The Vamps. Perhaps there could have been a slightly more inventive title, but I think it's a nice introduction for them, just letting the world know who they actually are. I cannot think of the last album I bought that I loved every song on. But I love every song on this album. 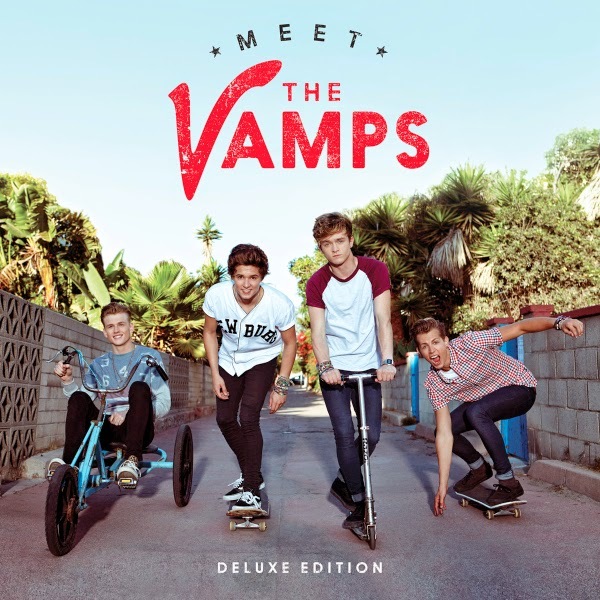 I always expect to have at least a few tracks that I feel very 'meh' about, and one or two that I can't listen to without wanting to pull my ears off of my head, but, The Vamps have delivered something unconditionally wonderful in my opinion. Obviously how much you like the album will be dependent on the type of music you like, but if you think that you won't like the band because they're 'just another group of teenage boys writing love songs' then you really couldn't be anymore wrong. There is a lot of heart in the album, but there's the perfect combination of upbeat songs and ballads, with country vibes that make me feel like I'm on a road trip in the height of spring. It's fresh, it's new, but it's kind of old school, and I love it. This song was what really started to make me interested in The Vamps' music. It was their second single and I think it's the perfect song to commence the album, giving a strong taste of what's to come. This song is the guitar in my eyes, and throughout the whole album it's the guitar that is the dominate feature. It seems bizarre but it's so rare these days to have an album that's consistently acoustic and that's probably why I like it so much. Wildheart is fun and young and free, and the music video for the single expresses that entirely. The song made me actually like the band rather than just listen to their music in a nonchalant manner. Last Night is upbeat and fun, and to me literally just sounds like four boys having fun. It's catchy and very 'pop' and that really works. 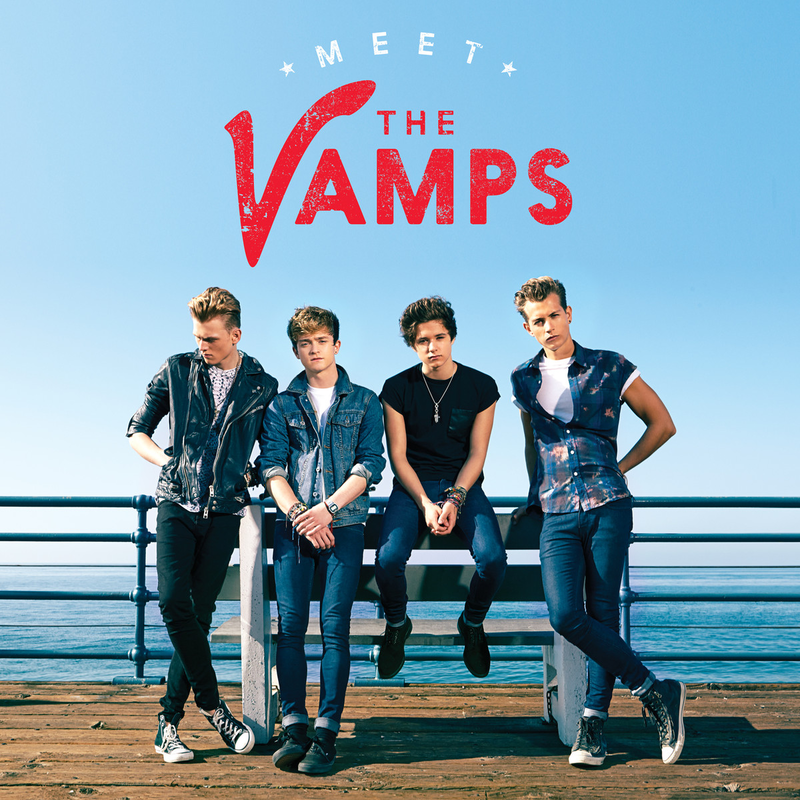 It was The Vamps' third single and the music video really brings out each of their characters. The lyrics basically outline the life of many a teenager, making it notably relatable to most, that or reminiscent of prior times. It literally managed to become my favourite song after listening to it once and I don't really even know how. It's perfect basically. I have no further comments. Listen to it. Listen to it right now. Being the band's debut single, Can We Dance kind of represents them. It's young and quirky, and ultimately very polite. Asking someone to dance is now such an old fashioned idea but it's the sweetest thing, and the build up to the chorus in this song is my favourite part by a million trillion miles; it sounds cute and just somewhat confused. Everything is adorable and it's hurting my heart. It's so driven instrumentally and I can just feel every aspect of the production somehow. The first time I heard Girls On TV was about a month ago when The Vamps were supporting The Wanted at the O2 in London (I posted about it if ya wanna have a lil read: http://abbielour.blogspot.co.uk/2014/03/the-wanted-word-of-mouth-tour-london.html). And it was so upbeat but with this relaxed backbeat that hints at a reggae influence, which is actually apparent in quite a few of their songs. The band name-drop Beyoncé and Rihanna within five seconds of each other - the controversy - but it works. The use of the ukelele is my favourite aspect, creating an aura of relaxation and I suppose innocence. Risk It All starts with just vocals and an acoustic guitar, and slowly builds up in a moderate kind of way, and then the chorus is belted. It's quite 'chanty,' if that's a thing; I can imagine a crowd singing along to it because that's kind of how the backing vocals sound at times. 'AAAAAAAAaAaAAAALL' is an example of this (even though that's lead and backing vocals w/e), as well as the middle eight and 'JUST DO IT, YOU PUT ME THROUGH IT.' I want to go and chant it at my neighbours but I think they would completely misunderstand what was happening. CECILIAAAAA YOU'RE BREAKING MY HEART. All the chanting, I love it. Really, I feel like even though this song is somewhat sad, it's so upbeat and sounds really positive. I also heard this song when I saw The Vamps last month and everyone seemed really into it despite not knowing the song. I feel like it's sort of about trying to ignore infatuation and then having everyone constantly surround you with images/memories of that person and reminding you of everything you did wrong. How do they make that sound so happy? I don't get it, but I like it. Ballads are often done wrong, that's something I've come to notice a lot. However, this ballad is a complete exception. A lot of the time it feels like the emotion is just too forced, but in Another World the lyrics seem so natural and effortless, and instrumentally the song just flows. It seems very nostalgic and that's my favourite feature in any song, so this is a real winner in my opinion. Cute is the first word that comes to mind when considering this song. It is soooooo cute. It makes me think of spring and the idea of love blooming, the careless and free feeling of being around someone that you really want to be around. Equally it's quite cautious, with the want for things to 'stay the same.' I think this is what makes the song most relatable, because at one time or another we've all been in a situation where we don't want things to change. This song is pretty and sweet, and causes the album to continue to bloom. Shout About It was actually the first song I listened to from the album and I don't really know why considering it's track 10, but it drew me in and I'm actually rather glad it was the first one I heard. There's something in the mellow guitar and soft piano that's incredibly alluring and utterly stunning. It's kind of nice that they're singing about shouting and yet the song is a contradiction of this and is so soft and quietly charming. This song really reminds me of Mcfly, especially Love Is Easy, and yet equally it's very different. It's the perfect acoustic track and I can't stress enough how wonderful it is to hear a truly acoustically driven band. It sounds hopeful, being very fitting with the lyrics, and it just flows perfectly. The harmonies are my favourite feature by far in this song, slotting together like two hands. In the first bar I actually almost thought this was a Goo Goo Dolls song, and so I admire the band's versatility whilst still using the same instruments and not delving miles outside their genre. This song is beautiful and it always makes me rather sad how the saddest songs are always the prettiest; it's tragic. But I think that it's because they're so full of genuine emotion and the artist is entirely connected with the lyrics. It's stunning. If I was to sum Dangerous up in one word then it would probably be quirky, but I think you have to listen to it all the way through before coming to that conclusion. The chorus is my favourite part of this song because I feel like it's so driven rhythmically at this point, even more so than in the verses. I also like the snappy guitar riffs in the verses; actually maybe they're my favourite part. I think they might be. I've just listened to it again; they are my favourite feature. And now I can't get them out of my head hahaha. I like the bass line as well, you can really hear it all throughout unlike a lot of songs you hear nowadays where it's practically hidden. This song is cuuuuuute. I feel like most of the album is cute but this song more so than others. The lyrics are sweet and considerate and generally just filled with adoration. 'I'd wait all day just for a maybe,' is one of the lame things I'd love for someone to say to me: mega sighh. I love the piano in this, it's so pretty and delicate, matching the overall tone of the song. Smile is another chanty one and I find myself really wanting to hear it at a festival; it's so upbeat and joyful that it would fit in so well. It makes me want to yell at people to smile. I'm really not someone who shouts either, so it's a strange affect. Again, another solid track that I seem to be unable to tire of. Contrary to popular belief, On the Floor is not a cover of JLo's song lolz (that's what I was expecting anyway haha). I love it. It's so young and just sounds like it's aching with this naïvety and inexperience. It's sweet x1942793289. The consistent acoustic drive throughout is literally my favourite thing in the whole world; I honestly can't get enough. Similarly to Can We Dance it sounds very considerate and just caring and nice (describing something as 'nice' is actually the biggest compliment I can offer because it means it's just nice and nice in my eyes means utterly wonderful in an understated way; not too much but just enough. I feel like the word is constantly undersold; just FYI). Golden's fun. It's youthful and I can imagine would sound better live???? I'm not sure why I feel like this, but it just seems to me like a track that should be on full volume and belted out. It makes me wanna clap and dance and generally just move in some sort of bizarre, free way (which would probably cause onlookers a lot of stress as I can't dance attttt allllllll). I think that Fall is a really great track to end the album with. Often I find ending with a ballad is somewhat foolish as it's usually better to go out with a bang, but the song really builds up throughout the first verse and then there's a chanty chorus and I was sold despite my cautious first impression. It feels like the album is a progression from spring to summer in my eyes, as odd as that may sound. It's like the temperature outside getting warmer and occasionally dipping down again (hey ballads), and then it ends in summer. It's wonderful. I hope that other people will enjoy this album as much as I do so we can all sit around a campfire, hold hands and sing merrily into the night; that or dance around in a field like maniacs, I don't really mind which. The Vamps are going on tour in September/October and I would highly recommend going along because they put everything into performing live and to be honest I think just the atmosphere would make it worth it.